A nephrite jade cup, supported on a low foot, the gently rounded sides curving in towards the waist and flaring out again at the rim. The sides are carved with two handles in the form of stylised dragons, with detailed eyes and horns, biting the rim of the small vessel. The stone is of variegated brown, black and oatmeal tones, with small areas of red veining. The practice of burning jade to make it appear older was quite popular in the Ming and Qing dynasties and is often seen in combination with a form that is inspired by ancient vessels. 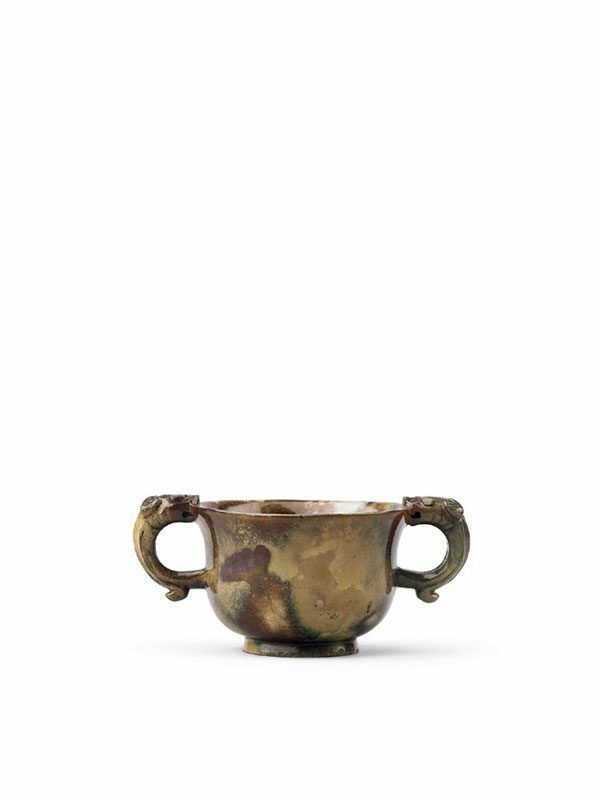 In the case of the present cup, it is inspired by a bronze ritual bowl of gui form. Both forms of imitating the ancient would have held strong appeal for the informed scholar, who probably would have used this small cup as a water vessel on his desk. Jade cups adorned with stylised dragon handles first appear in the Song dynasty, although as a rule the dragon’s heads turn outwards instead of facing the cup: for example a ten-sided jade cup in the collection of the Palace Museum, Beijing. 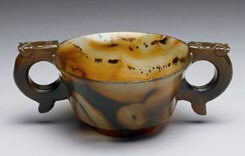 Three comparable Qing dynasty examples with similar design of the dragon handles, including one jade and two agate cups, were previously in the Qing Court collection and are now in the collection of the National Palace Museum, Taipei (fig. 1). A jade cup with two boy-shaped handles, similarly enhanced with a burning technique to acquire the archaic atmosphere, was made in the early Qing dynasty and was highly appreciated by the Qianlong Emperor (1736 – 1795); it is now in the collection of the Palace Museum, Beijing.